In the last decade (2000-2010), we saw the number of new antibiotic approvals drop successively each year; FDA changed the rules of the approval process without providing public guidance; many antibiotic companies fled the therapeutic area; investments were redirected to oncology projects which had a much better ROI. The IDSA 10 x ’20 initiative was meant to reverse the trend and set the goal of 10 new antibiotics by 2020. With resistant pathogens popping up everywhere, MRSA had already become a household name. The campaign for renewed antibiotic development was highly publicized, and frequent news about drug resistance, the ‘end of the antibiotic era’ and other gloomy stories added support for the message that we need a new generation of antibiotics soon. The existing armamentarium of antibiotics was coming to the end of its useful lifespan. There was hope that – with some regulatory hurdles removed – companies would re-engage. Where do we stand now, in Year 6 of this 10-Year productivity plan? For sure, most companies that once had focused on antibacterial R&D have not returned (Bayer, Novartis, Roche, Pfizer, AZ) and the effort at GSK and Merck seems rather minimalistic/opportunistic relying mostly on IMI and government / BARDA funding to support their in-house ID programs. Of course there were some other noteworthy advances and antibiotic approvals. Sirturo (bedaquiline); was approved (somewhat surprisingly given the imbalance in mortality) for the treatment of MDR tuberculosis in December 2012, and Dificid (fidaxomicin) made quite a splash with very good data (fewer recurrent infections) when it was approved in May 2011. Additional indications were garnered by several drugs during this time frame; telavancin’s approval for HABP/VABP caused by S. aureus in 2013 stands as an example for several others. But let’s face it: most of the energy and excitement in the last 5 years came from the HCV arena where break-through drugs created all the excitement (and industry interest). 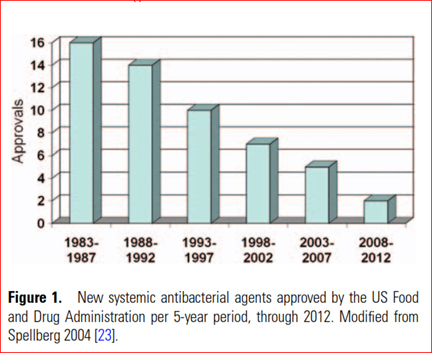 Looking back at our list of systemic antibacterials above, we can take comfort in the numerical progress made. ID folks have a tendency to complain a lot: first, they wanted more Gram-positive drugs for MRSA, when they materialized, they complained about the lack of Gram-negative drugs. Industry actually heeded the call otherwise we’d be much worse off. Looking forward, the list of Phase 3 candidates nearing NDA and approval status is a mixed bunch of drugs providing at best incremental improvements in spectrum. There is at least 1 more avibactam combination in development (aztreonam/avibactam) but all other drugs in late-stage development are from well-known classes (see our recently updated QIDP list). What is still lacking is significant qualitative differentiation. The field of Phase 2 drugs is a bit more diversified and has some outstanding candidates but most are without big company backing and are moving forward at a snail’s pace. There has been progress and there is a good chance that the goals of the 10x’20 initiative can be met. So far, so good: 6 new antibiotics in 6 years is quite an achievement given the circumstances. Let’s hope the trend continues as the current pipeline is still quite empty. We lack depth in the candidate field: If one fails, there is just no fast-follower to replace a failed front-runner. This entry was posted in The News, The Viewpoint and tagged Allphase Pharma Consulting, antibiotic blog, antibiotic pipeline, AstraZeneca, Avycaz, aztreonam/avibactam, Basilea, Bayer, bedaquiline, ceftaroline, Ceftazidime/avibactam, ceftolozane/tazobactam, dalbavancin, Dalvance, defensin, delafloxacin, Dificid, eravacycline, FabI inhibitor, fidoxamicin, Harald Reinhart, MDR drugs, Merck, omadacycline, Orbactiv, oritavancin, Paratek, Pfizer, POL7080, Polyphor, Roche, Shionogi, Sirturo, Sivextro, tedizolid, televancin, Tetraphase, Vibativ, Zerbaxa, Zinforo by Harald. Bookmark the permalink.